August 6th, 2014 | Organizing and Decorating. The bathroom is one of the busiest place in the home, so finding the time to unpack and organize after relocating is essential. The bathroom also is the most confined space, which presents challenges in avoiding clutter, but because of the size, is relatively simple to organize. The solution is putting the items close to where they are needed as well as tailoring to the number and type of people using the bathroom. Family bathrooms face challenges of organizing tissues, toilet paper, cups, medicine, towels as well as the individual products for particular members of the family. Break up the bathroom into zones to focus on these specific needs, such as the medicine cabinet, sinks and vanities, shower and bath, toilet storage, walls, doors and floor space. The medicine cabinet is ideal to keep all of those small everyday items well organized and out of sight. To start, remove everything and give the cabinet a good cleaning. Throw away empty containers and expired medications (Make sure you dispose of them properly by checking poison control). Organize what is left by putting items into groups. For example, put everything to do with dental care in the same area. Take out the items that don’t fit and either store them under the sink or put it in a smaller container to fit in the cabinet. The area around your sink provides a place to put everyday items near where they will be used, but may not fit in the medicine cabinet. Organize this zone from top to bottom, starting with the sink and moving to the drawers. The surface holds personal care items that are used every day. Whatever you decide to put on the surface, keep it contained with a caddy, baskets, trays or bins. Drawers give you the opportunity to organize often-used supplies, such as cosmetics, while still providing quick and easy access. Organize the drawers based on type of products and try to keep the groups separate. Beneath the sink is a good area for oversized items and concealing items that don’t quite fit anywhere else, for example, cleaning items and back up supplies. Add door racks, baskets and specialized bucket to achieve optimal storage and organization. Keep in mind the area under the sink can be reached by younger children, so you may want to consider a safety latch. To avoid clutter around the edges of the shower/bath area, use wire or plastic storage containers. Corner shelves in the shower are a great way to store products for multiple people. If toys are used in the bathtub, keep them contained with something as simple as a bucket. This seems to be an odd area to provide storage, but there are multiple ways to do so. On top of the toilet tank is a small surface that you can place a caddy. The slim surface between the toilet and the wall can have hanging or standing storage. Étagères are an extra-long cabinet to fit over your toilet tank, which provides the most efficient storage in the bathroom. Adding shelves above or beside the toilet provides storage, but make sure to measure and buy shelving that is meant for the bathroom. 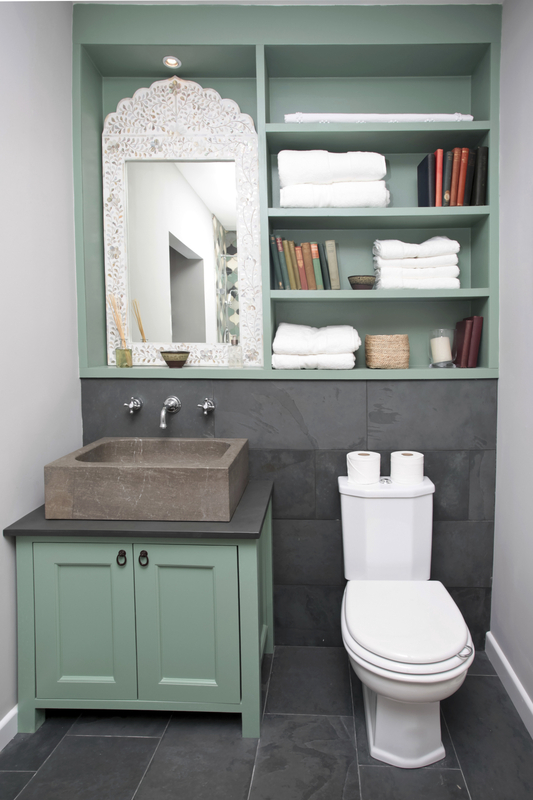 When seeking storage in the bathroom, you will have to look at all surfaces as potential storage – no matter how big or small. Hooks, pegs, shelves and bars provide effective storage for towels along the walls. If you can’t find room on the wall, the back of the bathroom door is a great option with over the door shelves or hooks. If you have ample square footage, standing cabinets and storage towers come in various sizes to provide extra storage. Hampers are ideally kept in the bathroom and can be found in different shapes and sizes, including free-standing ones or bags that can be hung from different places. Once the bathroom is organized it requires minimal organization maintenance that can be done during routine cleaning. Date Check: Every six months go through the medicine cabinet to discard medications that are empty and expired. Prune Publications: Take a minute to look through the magazines on the magazine rack and remove old issues. Inventory Assessments: Before shopping, check the levels of personal products, including toilet paper. Come back on Friday, August 8 to explore the organization of family and living rooms. I heard the best about Wheaton I will contact you soon for my new relocation needs. Thanks for the bathroom tips, it will be help me get organized faster.